"Is Matt Groening on our Olympics committee? First the 2012 logo looks like Lisa Simpson giving head to Bart, and now we have Kodos & Kang as our mascots?" "They look like something you would expect to find chasing Doctor Who." "Its a fair bet that the contestants on Junior Apprentice will have to design something this series, and if they come up with anything half as bad as those silver dildos they'll get a kick up the arse from Sir Alan on their way out the boardroom"
"was the brief to design japanese manga penises? "I suggest jazzing them up with a variety of amusing sounding visible farts. The kids will love em." "They look like what I imagine humans will look like in 10 years, once Apple buys the species and merges it with the iPod to make the iHuman." 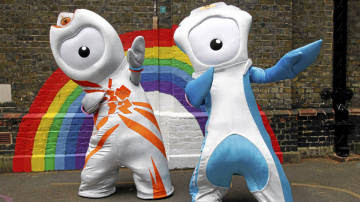 The designers claim that they are appealing primarily to kiddies, and the kiddies like the mascots. But that's just another example of how the people in charge have no clue of what's important. It's nice that kids are entertained, but the Olympics isn't primarily about children. Kids don't participate, and they're not the audience. Adults are. So why this infantilization of what is a serious business for a few talented grownups? Sure, kids today will be the Olympians of tomorrow, but today's 7-year old practising scales on the trumpet will be tomorrow's symphony orchestra musician; we don't try to market season's tickets to the opera with cutesy appeals to children. The fact that they are non-gender specific will prevent negative gender stereotypes forming. The colours are OK but I would have preferred a burnished one which could have represented alternative skin colour which would assist in communicating the diversity of populace in the UK. We have to take these things into consideration and not pander to the cynicism of uneducated mass. I suspect that that's a pretty close reading of what was going on in the designers' minds when they hatched these abominations: Can't be identifiably male or female, because it's an article of faith that gender is both optional and infinitely malleable. If you come down on one side or the other, someone will be upset. Can't make it look like a human because you'd have to choose a color for it, and too many "alternative skin colours" would be clamouring for representation. And most of all, it can't look like anything identifiably British because that would be to "pander to the cynicism of the uneducated mass". The ignorant booboisie has a stock of mental images that say "British", based on centuries of history and common culture: the lion, the bulldog, the Beefeater, Sherlock Holmes, London bobby, teapots, Big Ben. It is the job of the superior, deracinated cosmopolitan uber-class to stamp on those homely images and make a point of offensively replacing them with...this. Shapeless blobs that mean nothing. We're having a deliriously splendid spring here in Ottawa - I've never experienced anything like it since I moved here in 1984. The winter was quite mild, not too much snow, and the warm weather started quite early back in April. But within the last week, we've gone from spring to summer, and we haven't even reached the Victoria Day weekend yet - that's our "official" last frost date, but we're 2-3 weeks ahead of schedule as far as gardening weather goes. We planted corn out in the New Garden this weekend, and I actually had to turn the sprinkler on to water the garden afterwards; it was so dry, it was like those old movies we used to see in school about farmers during the Depression trying to plant seeds in hot, crumbly dust. The first potatoes I planted a few weeks ago are up and already about 4" high, and the later plantings are breaking through the soil right now. The one thing that might suffer from the sun and high temperatures (it's 24 today, and it's going up to 30 next week!) will be the peas: they like cool weather, and it just didn't last long enough for the plants to grow up, so we'll have to see what happens to them. It's a fair tradeoff, though, if the hot weather benefits the other vegetables. Maybe this year we'll get tomatoes with a decent flavour - it's been 3 years of cool summers, with watery, tasteless tomatoes as a result. The raspberries taste better too when it's good and hot. Our early variety are doing great, with flowers about to open all over the canes. I finally lost patience with the damaged black currant bush; I gave it several years to recover, but it just wouldn't produce fruit. Last year I bought a new one and planted it beside the old one - they say that planting different varieties together can improve yield. Well, this year the entire old bush produced fewer berries than just ONE branch of the new bush! I put the axe to the root, and down it came. Then I replaced it with two more new bushes; with luck all 3 will grow well and we might even get enough to make a small amount of jam this year. The red and pink currants are so overloaded with green berries you can hardly see the leaves through them. I'll have to put the netting over them when they get bigger and closer to ripening. The one problem is one of the new black currants has got bugs - first I saw whiteflies, but was able to take care of them with insecticidal soap. But I spotted small worms and today I see that they've come back - I think they're sawfly larvae! This is a problem that usually assails gooseberries, but the two plants look rather similar and at the nursery they were stocked side-by-side, so I think the bugs were imported from the nursery. I discovered a small amount of malathion in a bottle in the garage, so this evening I'll go out and spray them to get rid of the pests. The lilac is in full swing (once again, several weeks ahead of schedule) and so are the lilies of the valley. I think the earliest rose bush - Double Blanc de Coubert - will have flowers open in another week. Everything else is doing great - hostas, clementines, daylilies. It's almost getting to the "too good to be true" level. Is some disaster lurking that will ruin everything? I'm starting to feel like the Englishman in Beyond the Fringe's "The Aftermyth of War" - the guy who spent the whole war out in the garden. I’ll always remember the day that war was declared. I was out in the garden at the time, planting some chrysanths. It was a grand year for chrysanths—1939. I wish we could have another one like it. What if they gave a big, dramatic gesture and nobody came? That's what happened this weekend, when The Episcopal Chicks...er...Church "consecrated" a phony "bishop" whose novelty act is being a lesbian. The event took place in the 13,500-seat Long Beach Arena, and drew a less than impressive crowd of 3,000. Like Sarah Hey at Stand Firm, I totally forgot about this event, even though I drop by my regular Episcopalian blogs pretty much every day, and had been reading comments about this shindig right up until the day before it happened. When it came right down to it I just didn't remember - too boring. And judging by the press coverage, I wasn't the only one. I found small blurbs on the wire services and CNN, and a couple of local LA papers covered the story, but that was it as far as North American interest goes. The British press covered it more, I expect because right now they're dancing around the issue of women bishops in the COE, and so it's temporarily topical for them. Next to them, the only interest was from the predictable homosexual interest sites. What is news ... what drives the media to cover the story ... is the fight with conservative religion. The secular cosmopolitan world fears conservative religion, and the media thrives on conflict. That’s why VGR got covered. It was the beginning of the real fight. Now that the fight is all but over, and the forces of peace, justice, enlightenment, and sexual incontinence have emerged victorious, the story has lost all the hooks that made it interesting. TEC really doesn’t understand this. It thinks it has a role to play in forming the brave new progressive world. But TEC is going to find out the hard way that the secular world is no more interested in liberal religion than any other kind. The liberals in TEC were never important to the press; the only people who ever were important in this story were the conservatives. What would WE say? How would WE react? No story about the ravings of the Madwoman of Second Avenue or the Simple Country Bishop of New Hampshire was complete without the quote from an appalled or saddened conservative. The fashionable liberals only mattered as goads and weapons to be used against the real Christians. Now that those people are gone, the tools are carelessly dropped on the ground and abandoned. "Because of my political ideas and...and everything I've done for you, you know what he thinks of me! I have no hold on him at all!" "Well, that's your tough luck." "Claude!" Philip had cried in panic. "Claude, they won't leave me out in the cold, will they? I belong, don't I? They've always said I belonged, they've always said they needed me ... they said they needed men like me, not like him, men with my ... my sort of spirit, remember? And after all I've done for them, after all my faith and service and loyalty to the cause--" "You damn fool," Slagenhop had snapped, "of what use are you to us without him?" Actually, 'Atlas Shrugged' is a very appropriate book to read right now, because it just occurred to me that TEC has "gone Galt". There were lots of references to this right after the last American election, with people declaring that they would "go Galt" and refuse to support a morally bankrupt government and social system. In the case of the Episcopal Church, it's actually happened. The people who believed, who did things, made things, kept the whole show running with their faith and energy, have withdrawn, like the "men of the mind" in Rand's novel. Now, all that's left are the freeloaders, the moochers, the parasites, the "second-handers", and the system they preside over is falling into chaos and collapse. A duck has started hanging out in our birdbath. As you can see, the stone birdbath is not exactly roomy; it only measures about 1' x 2', and the duck fits in it the way a human would fit into a normal bathtub. But she's come around for the past two evenings, and seems very content just to climb in, drink a lot, and soak her feet. Unfortunately, she also poops as soon as she gets into the water, so I have to clean it out and refill it as soon as she leaves. She goes and sits down on the neighbours' lawn while I sweep out the dirty water and pour in more fresh. This usually attracts her back for a second visit! She departs before it gets dark. I was worried that she might be sick or injured, but she looks fine - no limping, no hanging wing. I've noticed that she seems to be alone. Maybe she lost her mate, or for some reason didn't find one, and has no eggs to take care of. Anyway, she seems happy to just loaf around here for awhile. I don't know what she eats, though the neighbours have some good birdfeeders which might drop seeds on the ground. Ducks eat vegetation, too, I believe, and there's plenty of grass around. The river is a few blocks away, but she seems to feel that she's got everything she needs right here. She must have a routine during the day, because she only comes by in the later afternoons.